My favorite ceviche is the Peruvian variety: lots of lime juice with a bit of ginger and some spice. The lime juice that’s leftover after the fish has cooked in it is referred to as “leche de tigre” or “tiger’s milk.” Many say it’s the perfect remedy for a wicked hangover. I haven’t been tempted to make this for myself when I’ve been suffering but I wouldn’t be surprised if it’d worked. 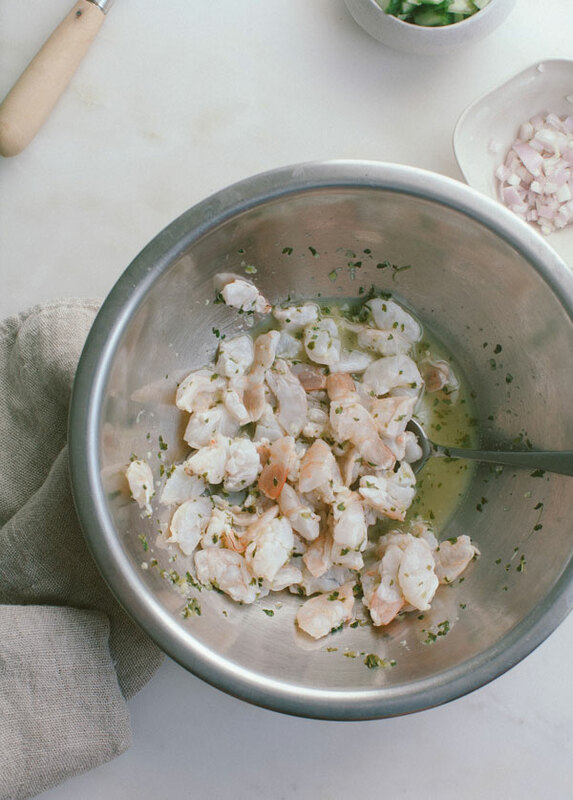 The shrimp will actually cook in the lime juice; going from raw to opaque in the matter of 20 to 30 minutes. The ease with this recipe is that the lime juice mixture is made in the food processor so this means no chopping, no mincing, no prep! 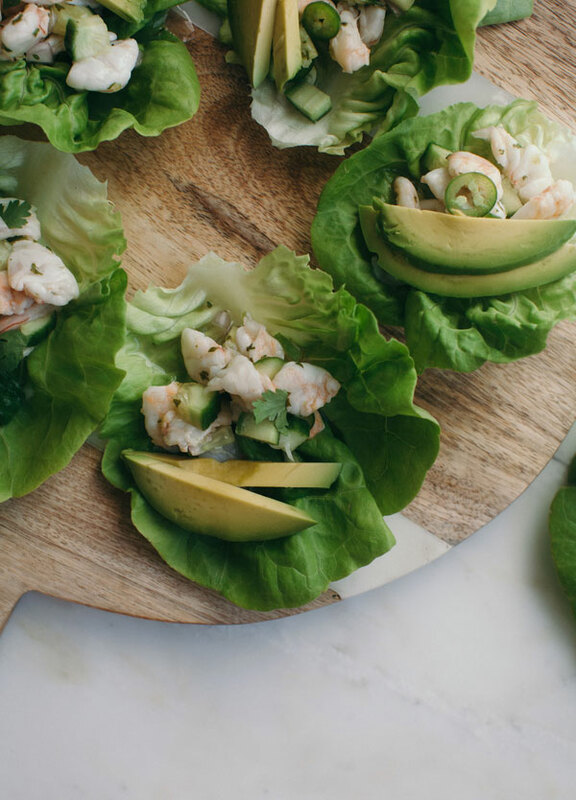 I used lettuce cups for a healthier option this time around, but there’s no reason you couldn’t eat this with a few tortilla chips. That’s not a very Peruvian thing to do but it is delicious. Add the shrimp to a medium bowl. To a food processor, add the jalapeño, ginger, cilantro, garlic, lime juice and a few pinches of salt. Pulse until all of the ingredients are minced and the mixture resembles a very loose sauce. 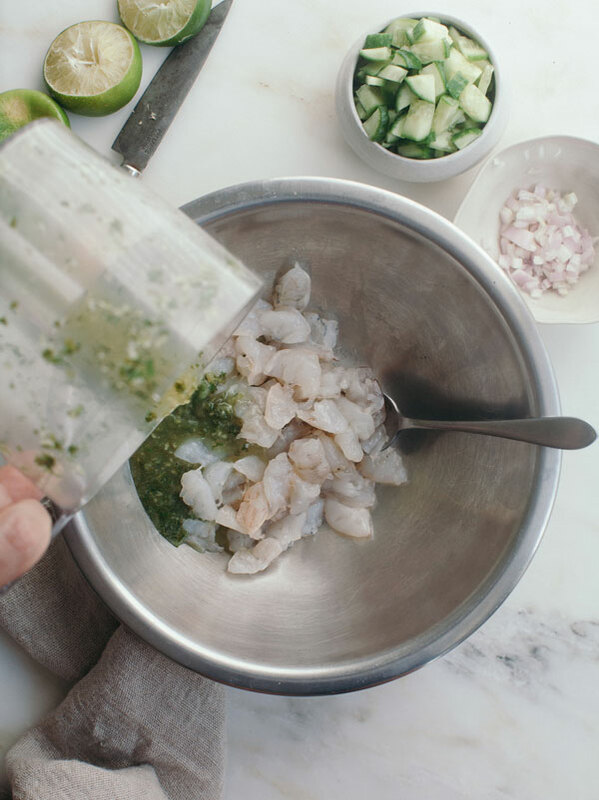 Pour the lime juice mixture over the shrimp and transfer to the fridge. The cooking process for shrimp should take about 20 to 30 minutes. Mix in the cucumber and minced shallot. If you’d like you can mix in more jalapeño slices. I’d say give it a try first since the heat from jalapeños can vary. Meanwhile, arrange the leaves of lettuce on a large plate or platter. Add spoonfuls to the center of each lettuce leaf. 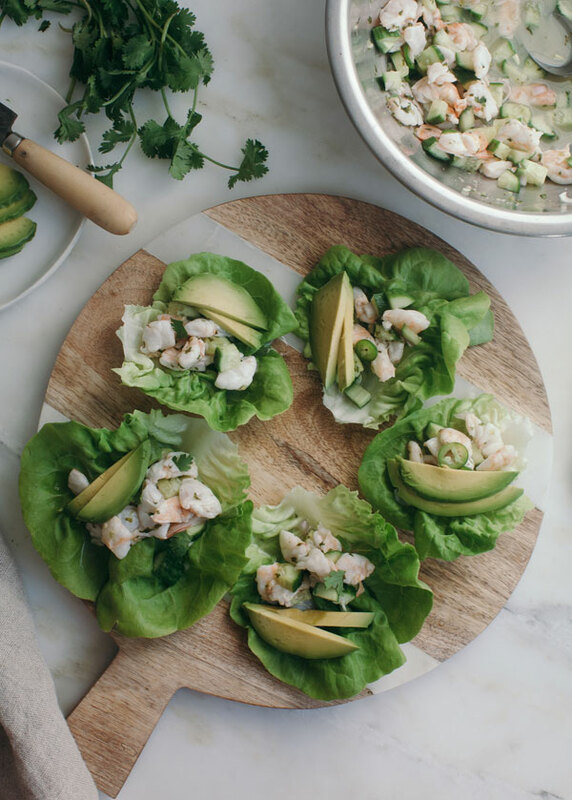 Garnish with a few pieces of avocado and cilantro leaves. Serve immediately.